These systems are designed to deal with high temperatures over lengthy periods, but like any mechanical plant they require proper maintenance to remain cool under pressure. Yet, there has been a tendency in recent years for some end users to take a bit of a chance with maintenance. When budgets are squeezed, maintenance is one of those areas that is often labelled ‘discretionary’. There has been something of a ‘race to the bottom’ on the price of maintenance contracts, but the most cost-effective approach is to carry out regular, planned maintenance to avoid breakdowns – because once something has broken down it is much more expensive to repair. Surely, if you have made the considerable investment required to purchase an expensive piece of specialised equipment, keeping it maintained is a bit of a ‘no brainer’. Increasingly, clients are becoming aware of the importance of considering lifetime operation when specifying FM contracts and events like this year’s extended heatwave and highly publicised building failures have given this greater urgency. Many building managers are also looking beyond simply securing life safety through risk assessment to how a building is operated for the comfort, wellness and productivity of its occupants. There is a greater grasp of the importance of whole life cost – particularly in complex buildings with specialist equipment like chillers. The government was recently criticised for taking too shortterm a view of building services following an inquiry by the House of Commons Public Accounts Committee into the way the government deals with its suppliers. Its report recommended that the government consider “the lifetime cost and value of a contract, not just the bottom line at the point the contract is commissioned”. It added that government procurers should “get better at managing contracts through their life” in order to ensure they deliver value for money. This suggests a change of approach for the public sector that is reflected in the private sector too. Items like rising energy costs and poor maintenance leading to higher bills and poor comfort conditions are now a greater priority for organisations and their financial managers. They now have higher expectations and want their FM providers to deliver an all-round service that takes the lifetime operation of equipment into account to reduce ongoing costs. Any drop in performance can also be catastrophic in a vital facility like a hospital or care home; and seriously disruptive in a busy commercial environment like an office or factory. Unexpected breakdowns and energy spikes also drive up lifetime costs, so it is clearly in everyone’s interests to get this right. 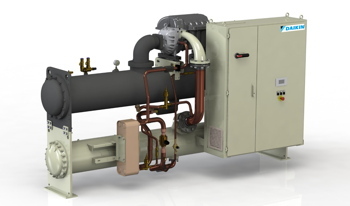 Some chillers are maintained directly by the manufacturer, but increasingly they are part of a general FM contract with the contractor responsible for all the building and estate systems. There is no problem with so-called ‘soft’ FM providers expanding their reach to manage more of a client’s built assets as they often have the management expertise to run a successful maintenance programme. However, they should not fall into the trap of thinking that critical, sophisticated equipment like chiller plant can be maintained without specialist training and expertise. Any piece of highly complex equipment requires specialised care and it is well worth the investment in that expertise for both the FM provider and their client. Contractors pitching for FM contracts will have to demonstrate return on investment for the end client – as well as guaranteeing legislative compliance – and planned, ongoing maintenance is the best strategy because it allows them to nip potential problems in the bud. A move towards continuous monitoring allows them to spot early warnings and digital tools are now widely available that allow this to be done remotely. They can see if the cooling system is not achieving its design capacity or efficiency due to incorrect operation, which could be due to low refrigerant charge or high operating pressures. A drop in performance of equipment can be catastrophic in facilities such as hospitals or care homes. Remote monitoring is a modern, sensible precaution. They can also use remote monitoring to analyse the system’s performance, before actually visiting the site, allowing them to address a problem before it becomes serious. Simply running a system until it breaks down is a seriously false economy. 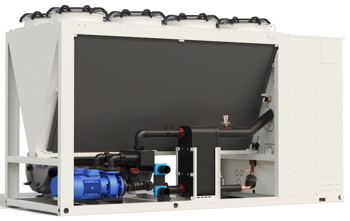 As a chiller’s performance starts to dip, so it becomes less effective and uses considerably more energy. Using digital tools can help an FM deliver a better and more targeted maintenance service while keeping their own costs under control. Remote monitoring of chillers is a sensible precaution and an investment that pays back many times over. Particularly during periods like this summer’s extended heatwave when the system can come under pressure, round-the-clock surveillance can ensure there is no interruption in service. It also provides highly valuable operating data, which can be used to fine tune systems in operation for maximum performance – giving the end user a further opportunity to reduce running costs. Our industry is moving into a new era for the way buildings and their services are procured and managed. We will, undoubtedly, see greater use of digital tools to support the changes the industry is demanding and the industry will need improved access to data that allows it to manage and maintain buildings more effectively – and safely. Trevor Jeffrey is national technical service solutions manager at Daikin Applied.